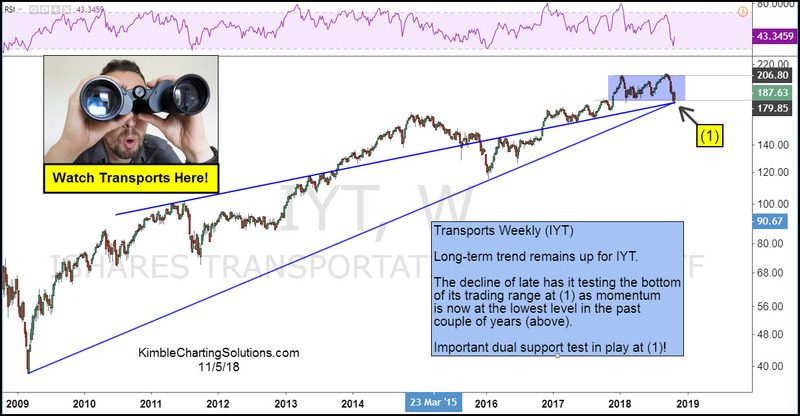 From Chris Kimble: A swift 30 point drop (nearly 15%) from mid-September through the end of October has the Transportation Sector (IYT) testing important long-term support. The Dow Jones Transports Sector (IYT) also represents an important slice of the domestic and global economy. So losing support here would not be good. Let’s look at the weekly chart of IYT. The iShares Transportation Average ETF (IYT) was trading at $187.83 per share on Tuesday morning, up $1.32 (+0.71%). Year-to-date, IYT has declined -1.65%, versus a 3.23% rise in the benchmark S&P 500 index during the same period. IYT currently has an ETF Daily News SMART Grade of A (Strong Buy), and is ranked #10 of 33 ETFs in the Industrials Equities ETFs category.